If you've picked up a shiny new laptop in the last year or so then there's a good chance it comes with one or more USB-C ports - indeed the latest MacBooks and MacBook Pros pretty much depend on it. So what's out there to help you make the most of this all-purpose, high-spec connection standard? Quite a lot, as it happens. Here we'll run down some of the best accessories currently on the market, covering the main types of add-on you're going to need, from port extenders to external disk drives. They should all work no matter what type of USB-C laptop you have, though you may want to get the "official" accessories for your computer, if they're available. If you're limited in the number of USB-C ports you've got on your laptop then something like this Satechi hub can really come in handy - it expands a single USB-C port into two USB 3.0 sockets, a 4K HDMI video output, and another pass-through USB-C port. That pass-through port can keep charging the laptop while you use the other ports, and it looks the part too, with a brushed aluminium finish that gives the hub a premium look. It comes in gold, rose gold, silver and space grey finishes, to match Apple's laptops. If you want to add some extra storage space to your USB-C-enabled laptop then the Samsung T3 SSD is worth a look - opting for solid-state storage does add a small premium on the price, but we'd say it's worth it based on the faster speeds you're going to get. The drive is available in 250GB, 500GB, 1TB and 2TB versions, with the price changing accordingly. The drive is remarkably small too, thanks again to that SSD technology, and with the help of Samsung's own app you can also use it with Android phones and tablets. How about turning one port into 11 with the chunky OWC USB-C Dock? It needs its own power, but turns your laptop into a serious productivity machine - with grey, gold, pink and silver colours to choose from, you can get one to match your computer perfectly. 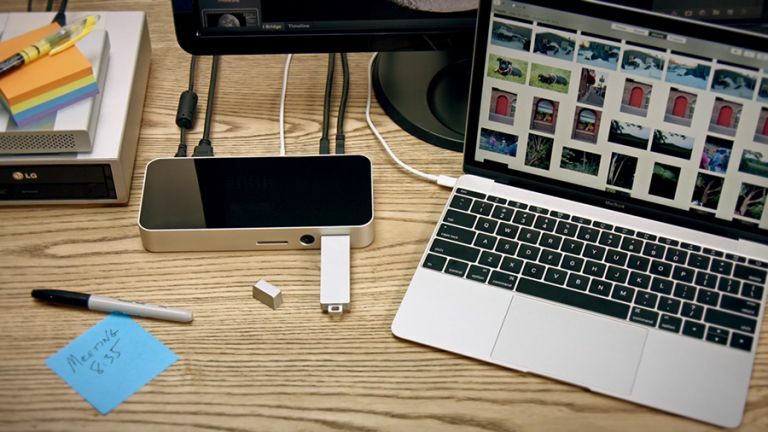 The dock offers four USB 3.0 Type-A ports, one USB 3.0 Type-C port, an SD card reader, HDMI output with 4K support, Gigabit Ethernet, audio in and out ports and the computer connection, and while it's been designed for MacBooks, it should work on any machine. After a little USB flash drive to go with your laptop? Want it to offer compatibility with older computers too? Look no further than this little device, which features a new USB-C port on one side and a more traditional USB connector on the other for extra versatility. The stick makes getting files on and off your devices a breeze, and it's available in 16GB, 32GB, 64GB, 128GB and 256GB sizes depending on how much data and spare cash you have. It also works with USB-C Android devices, with the accompanying SanDisk app. One of the big new enhancements to some USB-C laptops is Intel's Thunderbolt 3 technology, providing for fast data transfers. Thunderbolt 3 docks like this one from StarTech take advantage of the advanced performance capabilities of the Thunderbolt 3-based PCs like the XPS 13, while providing USB 3.0 and Ethernet ports still required for many applications (this particular dock is Windows-only). This incredible dock supports dual-4K monitors, with 3840 x 2160p or 4096 x 2160p on each display. Wowsers! USB-C can handle displays as well as power and data, and if you look around you'll come across a host of impressive monitors to hook up to your laptop from the likes of Dell and LG. What makes the MB168C+ monitor from Asus different is it's lightweight and portable. It pulls power from your laptop over the same USB-C cable, so it goes everywhere your laptop does, and a carrying case that doubles as a stand is included. You'll be surprised at just how useful a second screen is, for everything from spreadsheets to web browsing. There are still plenty of gadgets out there that make use of the older USB standards, and the Dodocool Charging Hub lets you charge and sync data from up to four of them at once. A pass-through USB-C port on the end lets you carry on charging your laptop as well. Grey and gold are your colour choices and the accessory should work with any of your USB 2.0 or USB 3.0 kit, with data transfer speeds topping out at 5Gbps. It's nice and cheap too, so you can add a significant upgrade your USB-C laptop without breaking the bank.